MANILA, Philippines- A grave site believed to be set aside for the late dictator Ferdinand Marcos was filled with stones bearing the names of martial law martyrs on Sunday, June 26. The campaign protest was attended by martial law survivors, relatives of victims and other concerned citizens. Representatives from different organizations such as UP SAMASA Alumni, Claimants 1081, Martial Law Chronicles Project, Nameless Heroes and Martyrs, Akbayan, Akbayan Youth, Dakila and Filipino Freethinkers carried the stones placed on Marcos’ reported grave site. 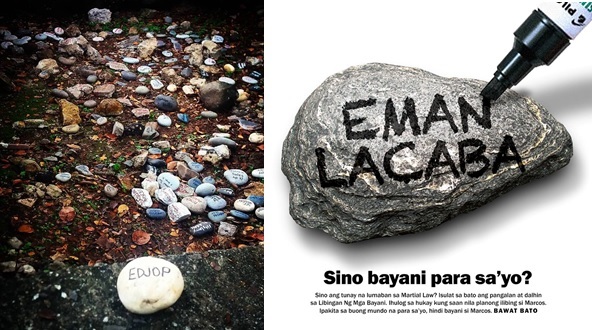 According to award-winning writer Miguel Syjuco, more than 100 people have left stones on the supposed grave site in Libingan ng Bayani in a protest campaign against the proposed burial of Marcos. In an article Syjuco wrote for Rappler, he said the movement is a call for all Filipinos “to use stones not as weapons but to build a foundation of dissent against those who long denied our country democracy, equality, safety, and truth”. Bawat Bato, a non-partisan initiative against the burial of Marcos at the Libingan ng Bayani is urging Filipinos to place a stone at the said grave site or in locations stained by the atrociousness of martial law. President-elect Rodrigo Duterte has earlier expressed his plans to allow the burial of Marcos at the cemetery honoring the country’s heroes not because the former leader is a hero but because he was a soldier. Despite Marcos’ critics opposing a hero’s burial for him, Duterte is determined to make arrangements for the former president’s burial saying the issue has been a source of division among Filipinos. "It is my sole decision. I accept full moral, legal responsibility. I believe it has created division in the country,” Duterte defended his decision. During his two-decade rule, Marcos was alleged of human right abuses, extra-judicial killings and accumulating ill-gotten wealth.